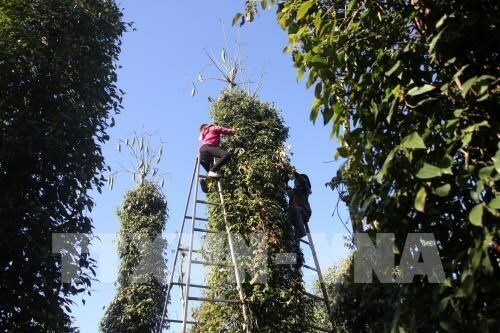 Quang Tri (VNA) – The central province of Quang Tri is promoting the application of high technology in the cultivation of pepper trees, one of the three main industrial crops of the province, in order to meet standards of the US and the EU. The province has cooperated with Organics More Co Ltd, an international company specialising in promoting organic farming, to help local farmers adopt cultivation processes in accordance with foreign standards. As of March this year, nearly 60 ha of pepper trees in Gio An commune, Gio Linh district, have been cultivated following European and US organic standards. The province has adopted policies to support farmers in adopting organic farming and applying technology in production. Pepper trees were brought to Quang Tri by the French in the late 19th – early 20th century and has been continuously grown since 1940 up to now. Pepper beans produced in Quang Tri are highly rated by both domestic and foreign traders thanks to the strong scent and spicy taste. Quang Tri has been registered as geographical indication (GI) since 2014 for both black and while pepper produced in Ho Xa town and Vinh Hien, Vinh Hoa and Vinh Nam in Gio Linh district. Last year, the areas under the GI protection were expanded to cover Cam Lo, Gio Linh, Vinh Linh and Huong Hoa districts.